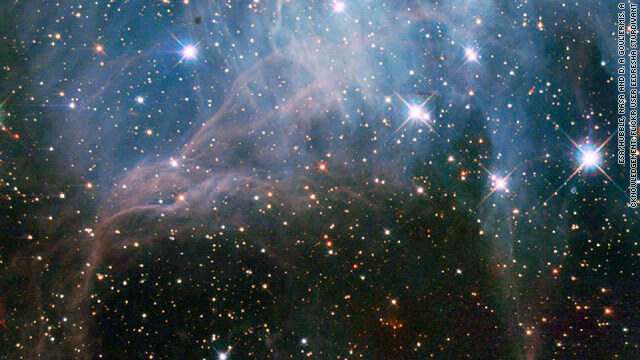 "Bright stars, shining through what looks like a haze in the night sky, are part of a young stellar grouping in one of the largest known star formation regions of the Large Magellanic Cloud, a dwarf satellite galaxy of the Milky Way. The image was captured by the NASA/ESA Hubble Space Telescope's Wide Field Planetary Camera 2. The stellar grouping, known to stargazers as NGC 2040 or LH 88, is a loose star cluster whose stars have a common origin and are drifting together through space. There are three different types of stellar associations defined by their stellar properties. NGC 2040 is an OB association, a grouping that usually contains 10–100 stars of type O and B–these are high-mass stars that have short but brilliant lives. It is thought that most of the stars in the Milky Way were born in OB associations. A version of this image was entered into the Hubble’s Hidden Treasures Image Processing Competition by contestant Eedresha Sturdivant. Hidden Treasures is an initiative to invite astronomy enthusiasts to search the Hubble archive for stunning images that have never been seen by the general public."